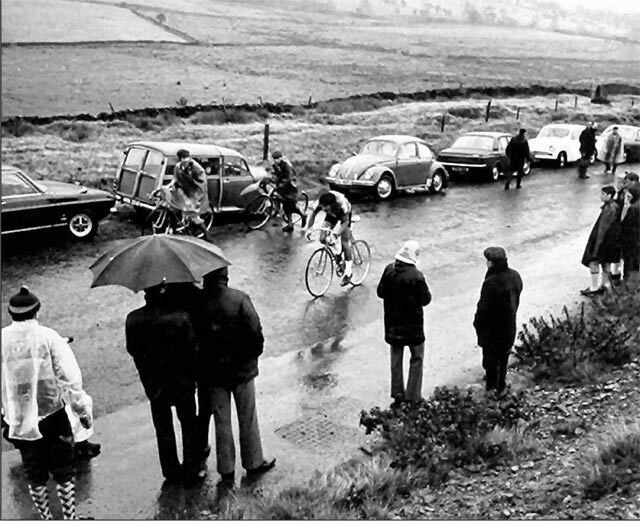 For drama and excitement, the Ardennes classics (Amstel Gold, Fleche Wallone and Liege Bastogne Liege) couldn’t match the earlier Belgian classics, like the Tour of Flanders. 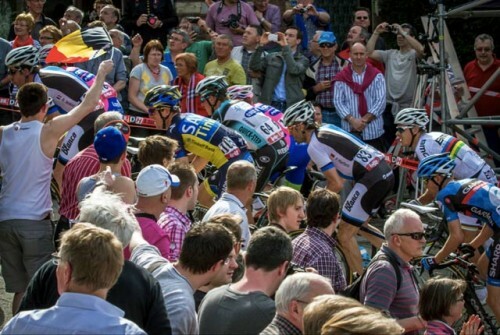 For some reasons, the courses of Flèche Wallone and Liege Bastogne Liege encourage more conservative racing. Liege Bastogne Liege was also doubly disappointing if you were trying to pick out a Sky rider to support. Still watching the peleton fragment on the Mur du Huy (during the Flèche Wallone) is a great sight; it may not last very long, but it is a great spectacle. 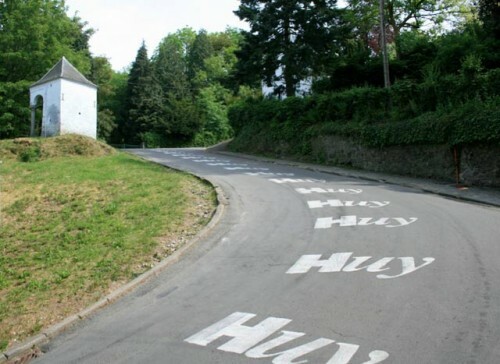 The Mur de Huy has definitely been added to the list of climbs to do. CR: around 3.30 – According to Strava, Romain Bardet did the climb in 3.36 in 2014. The interesting thing about the Mur du Huy is that all the commentary says the trick is to time your acceleration to perfection. You have to ‘go’ at the last possible moment. The history of Fleche Wallone is full of seeing riders create a winning margin, only to slow down to a crawl as another rider comes past at the last moment. This is what makes it so compelling viewing. You never know who is going to come around the corner at the last moment. In this article on the Mur de Huy, professional rider Marco Pinotti (69kg) says put out 440watts for the climb over 4 mins. But, says he can’t ever win there because it needs a rider who can put out a bigger wattage in a short space of time. 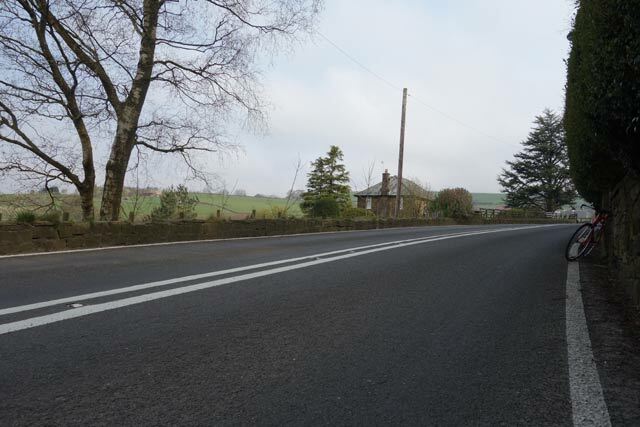 It’s food for thought for Pea Royd Lane because I always thought with hill climbs – you had to go as hard as possible right from the start and try and hang on. Team Sky always generate a lot of hubris.Overachiever, underachievers, there’s always plenty of opinions out on the world wide web. But, they have put up a reasonably showing in this seasons early classics – even if they haven’t yet landed a big victory. It was a shame strongman Ian Stannard crashed out shortly after winning an early season minor classic. Still Geraint Thomas and Stannard are both promising prospects for future. But, with the classics, good potential is not enough, you have to have the combination of luck, judgement and being in the right place at the right time. It’s also good to see Ben Swift come back to winning ways after a quite 2013. Wiggins has blown hot and cold all through his career, but he is getting close to having one of the most comprehensive ‘all rounder palmeres’ in the history of cycling. There are not many track world and Olympic champions to also win the Tour de France; if he could grab a monument like Paris-Roubaix before he retires, it will be a palmeres that very few will ever be able to match. Also, the resurgence of Bradley Wiggins could present Team Sky with that old chestnut of team leadership melodrama. There’s no question, that at the moment, Chris Froome will be the named team leader, and Bradley Wiggins has all but said he can’t go for another Grand tour win, but this year, stage 5 of the T de F is said to be a cobbled affair. What happens if Froome crashes or looses a couple of minutes on the cobbles? Would Wiggins (almost a cobbled specialist) wait? Or will Wiggins, perhaps suffer a communication malfunction as soon as the cobbles appear? But, given the apparent lack of strength in depth at Sky, Froome may well need Wiggins as a super-domestic. Perhaps the TdF will be the chance for Wiggins to play the role of Gregario du Luxe. Who knows which way it will go. In other circumstances, it might be funny to see a cyclist fall off on the last corner. 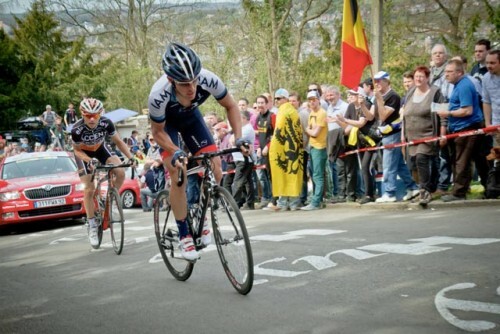 But, I couldn’t laugh at poor old Dan Martin – falling off in Liege Bastogne Liege with the finish line in sight. It’s just too close to the bone. A random selection of contemporary and classic cycling terms explained with varying degrees of lucidity. Some may give the impression of being entirely made up, which is probably because they are. ‘Pedalling in Circles.’ These days you seem to hear this expression quite frequently. 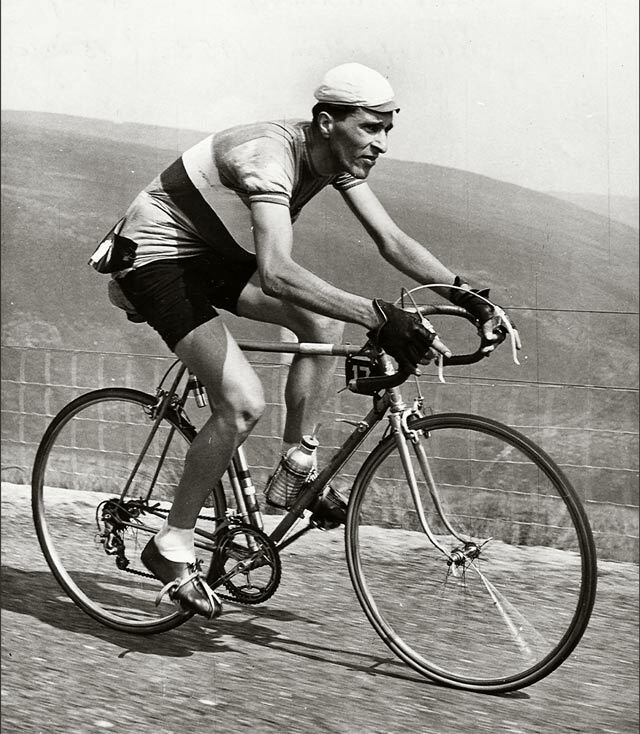 A good cyclist should ‘pedal in circles’ ( if you have standard cranks, you may be thinking it’s pretty hard to cycle in other shape and you’re right) When asked for advice about cycling, Fausto Coppi replied ‘trying pedalling harder’. This is the essence of pedalling in circles – keep those pedals moving. The actual idea of pedalling in circles, is that you don’t just push on the down stroke, but also pull on the way up. So your exercising pressure for the full 360 degrees of the pedal rotation, and not just the 180 degrees going down. An advantage of using clipless pedals and toeclips. Pedalling squares – Not quite the opposite of pedalling in circles. 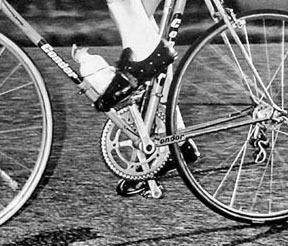 Pedalling squares means the cyclist is floundering, pushing a big gear with no élan and generally struggling. You pedal squares, when you bonk or blow up. To Half Wheel If you’re in the opposite of a serious chain gang, you may hear stately club members ask you not to ‘half wheel’. This is when an overeager cyclist keeps trying to push the pace of the group higher – by riding ahead and making other riders cycle faster to keep up. This is very much against the tradition of the traditional British club run. Wheelsucker – Someone who always sits behind another rider to benefit from drafting, and never going to the front of a group to do a turn. If a half-wheeler is trying to show off by going faster, the wheelsucker is a rider wanting to enjoy the efforts of others. It does depends on the type of wheelsucking you do. 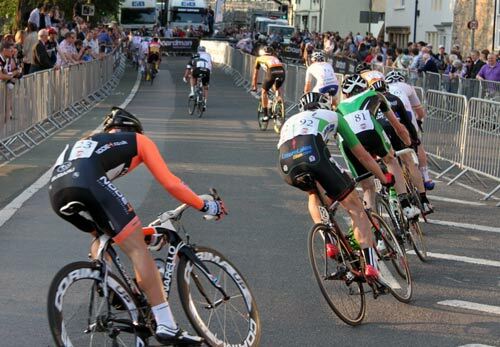 The best sprinters will never be at the front of the peleton until the last 100m of a race. But, it’s generally considered bad form to be a wheelsucker on your daily commute. 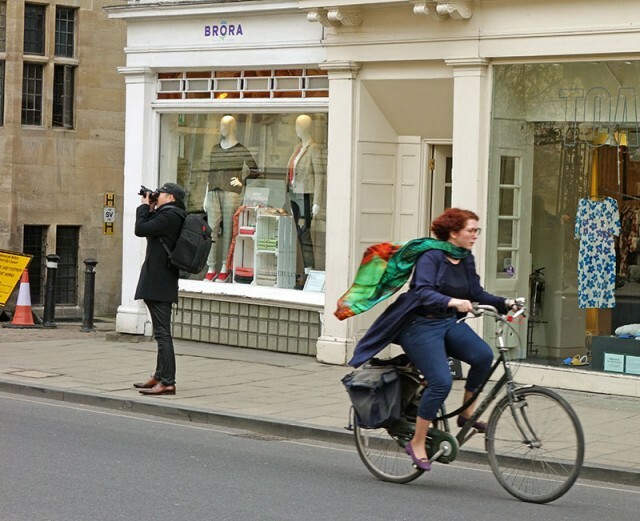 ‘Good style’ – It may seem curious you can have a good cycling style. But if you watch a race, you may hear the commentators say ‘he has a good style – he looks very good on the bike’. This may be followed by said rider going out the back. Looks can be deceptive. Good style is very rarely compatible with ‘gurning’ see below. But, one of the advantages of cycling is that you may be really rubbish, but as long as you ‘look good on the bike’ then it counts for something. Les Wilmot – Looking good on the bike. 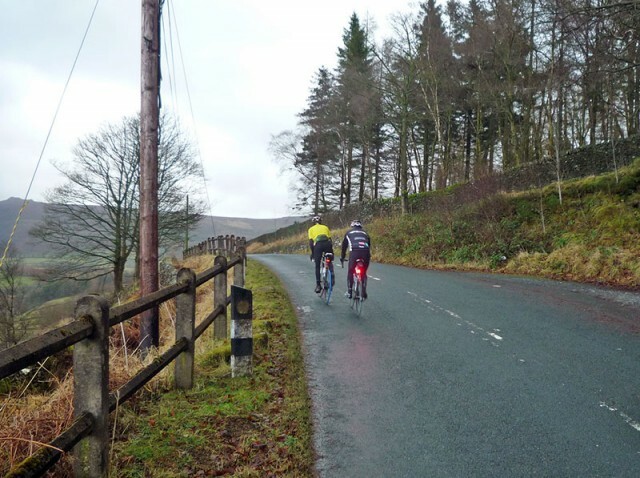 A training ride over Cragg Vale, Ripponden Bank and several other climbs which seem to proliferate around the Hebden Bridge area. 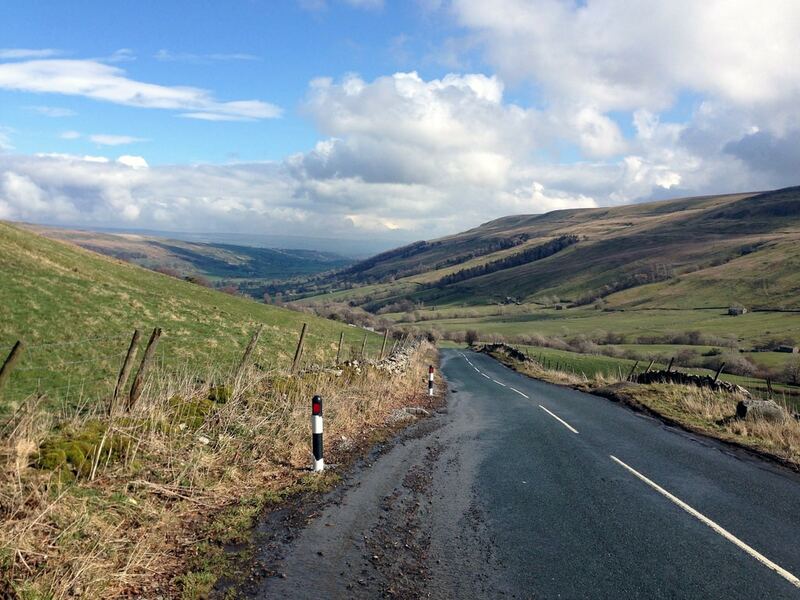 Some of the climbs like Oxenhope Moor, Cragg Vale and Ripponden Bank feature in the TDF stage 2. Shame they didn’t put Luddenden Moor in there. 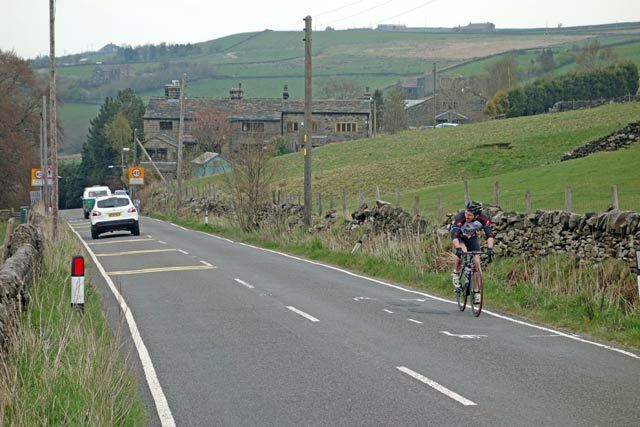 After Friday’s Buxton MTT, my legs were still a bit tired, but it was Easter Sunday, good weather and I was keen to check out some climbs in South Yorkshire, used in the upcoming TDF stage 2. I rarely go in this area, but it is great if you’re looking for hills to cycle up. Despite frequently getting lost and not always knowing where I was going, it was a good ride. From the top of Oxenhope moor, there is a great sweeping descent into Hebden Bridge. Not too steep, just nice and long. It will make a good climb the other way, with quite a significant height gain of over 280 metres. At Hebden Bridge, I had a vague idea to look for Mytholm Steps, but my OS map didn’t go that far. I ended up going miles past, ending up in Todmorden. I stopped to ask a kind elderly gentlemen, (he had a badge to say he was a veteran of the Normandy landings). He’d lived in Todmorden all his life, and told me I’d come 7 miles too far West. It would have been interesting to stop and talk to him more. But, I moved onto find some climbs. I saw this Pexwood lane, looking suitably interesting – winding it’s way up the edge of a moor. 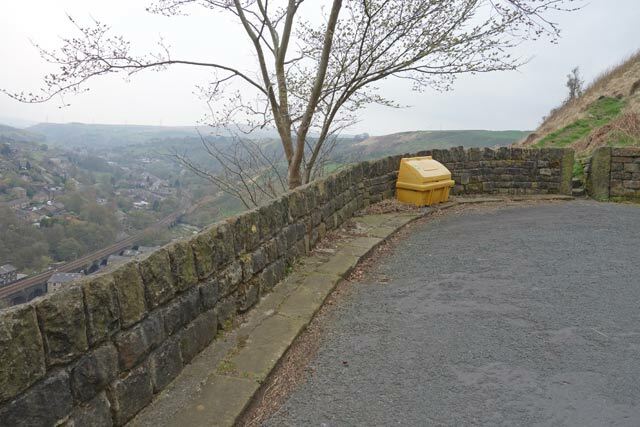 It was a great climb, with double switch backs – quite steep until it rather abruptly stopped at a ‘Private rood’ sign. I might have plodded on and tried my luck, but the road also deteriorated into an unmade surface. 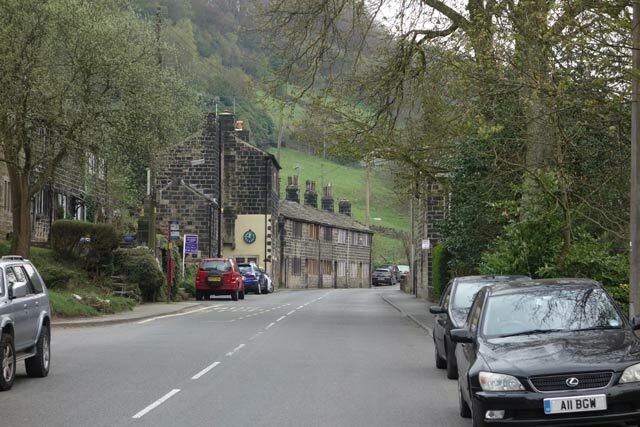 I turned around and went back to Mytholmroyd for the Cragg Vale climb. Cragg Vale proudly claims to be the longest continual ascent in England. 968 feet of climbing in 5.5 miles. There is nothing steep, it is a classic long drag or as Magnus Backstedt would say ‘A big ring climb’ Though I didn’t use my big ring, despite an encouraging tailwind. But, it was possible to keep a nice steady speed, even at the steepest section halfway through. Even at its steepest, it never seems to go over 7%, so you can do the whole climb seated down. It’s a good ‘easy’ taster of long Alpine climbs. You can get into a good rhythm and enjoy the scenery. Someone has put helpful km markers, telling you have long you have left. Though for some reason, who ever put these helpful markers on the road, decided the top of the climb was after -0.5 km of downhill. It did seem to kind of diminish the ‘longest continual ascent in England’ tag. The climb was very popular, I both ascended and descended Cragg Vale and saw a lot of cyclists going up and down. 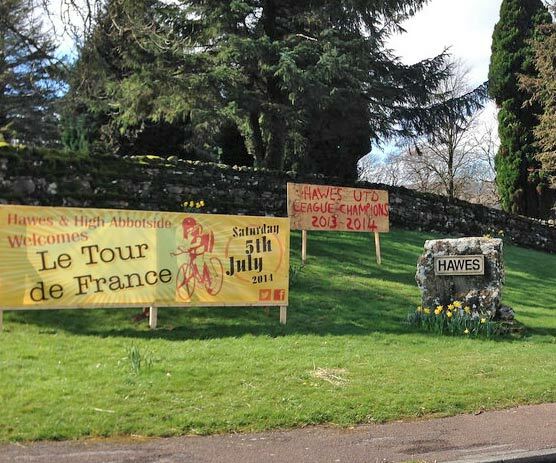 I’m sure the Tour de France has encouraged more to try the climb – it is definitely worth a visit for any cyclist. At the top of Cragg Vale a strong wind was blowing, which made the descent to Ripponden almost as slow as the climb. New York is always full of surprises. 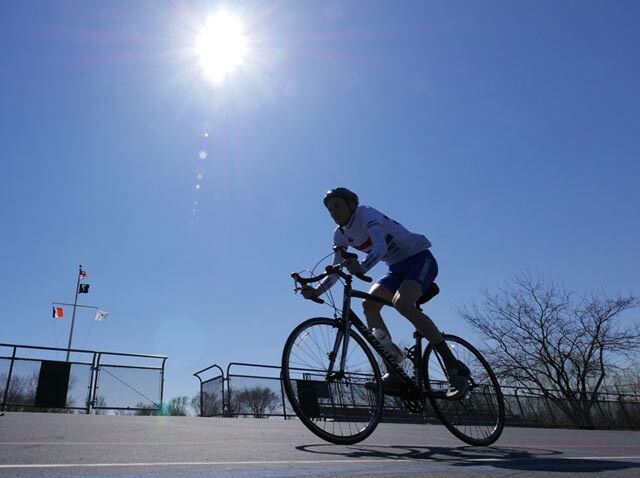 Here, in the middle of Queens, New York, there is the Kissena Velodrome. 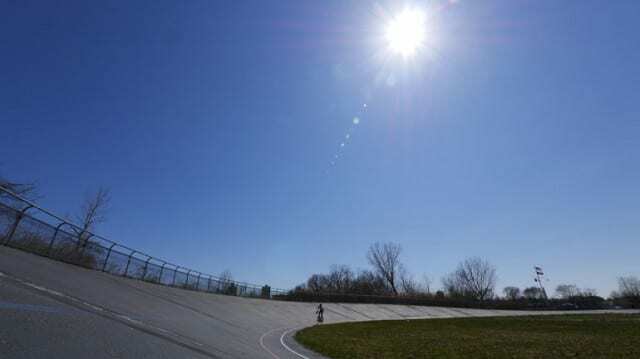 An outdoor concrete velodrome. It’s a bit lumpy, but if you’re looking for a traffic free cycling environment, it is an oasis in the desert. When I went during the week, I often had the place to myself. A good opportunity for a few intervals and training. After a heavy few weeks of mileage in March. This last week has been much quieter. Just a few recovery rides around the track this week. Ever since the Tour de France route was published a few months ago, I’ve been planning to ride the first stage as it includes some of my favourite roads in Yorkshire. 190km is a bit out of my comfort zone, but I wanted to see what it was like to do a full stage. In the end, I modified the route to avoid heavy traffic and ended up including some extra climbs. It turned out to be 120 miles, with 3,100 metres of climbing. It was a great day, and really enjoyed it, even if I did really suffer for the last 20 miles. I didn’t start in Leeds, but from Menston near the A65. The A65 is not the most cycle friendly road, so just before Addingham I turned right on the B6160 towards Bolton Abbey and Burnsall. 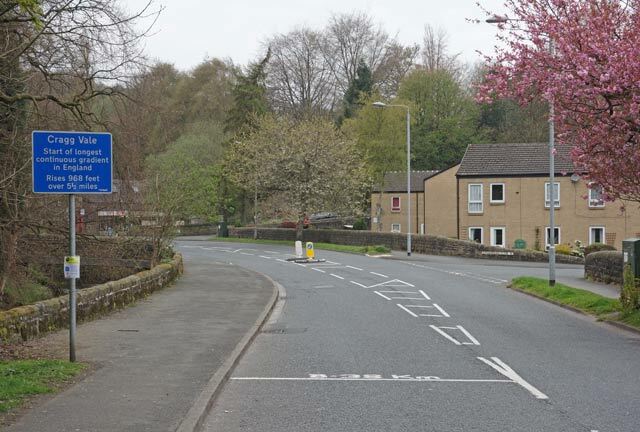 This cuts off a corner, but more importantly saves battling the articulated lorries on the Skipton bypass. The B road through Bolton Abbey and Burnsall is a really great cycling road. Little traffic and great scenery. It’s never flat and always rolling. At Grassington I rejoined the tour route proper on the B road towards Kettlewell and Bucken. 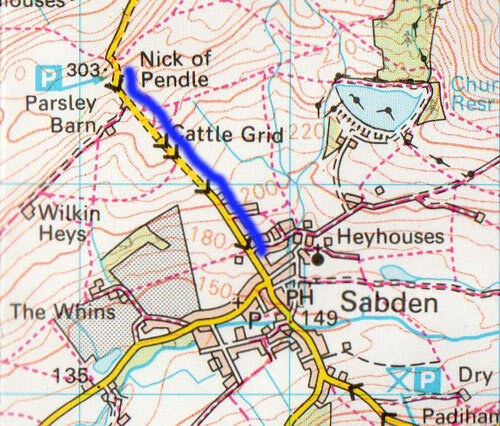 After you have passed the slate mine near Grassington, this becomes a good cycle road. It wanders up the Wharfe valley through good countryside. Today the traffic was quite light. Kidstones pass may only be a category 4, but it’s still pretty hard work. 130 metres of climbing, and quite steep around 16-17%. It will make a great place to watch the tour. 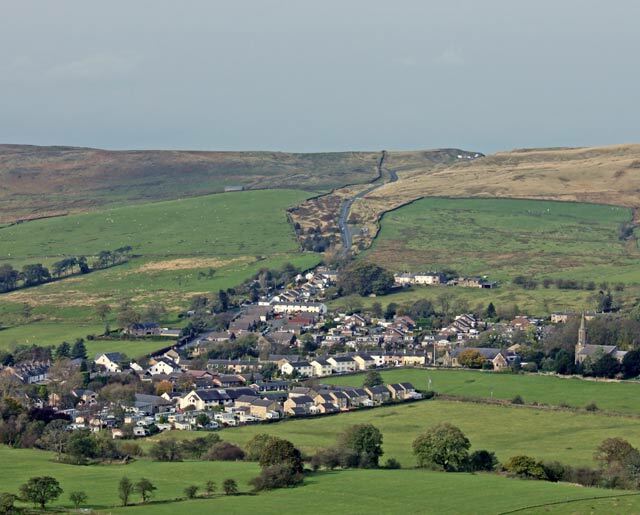 The Nick O Pendle hill climb is a testing climb from the village of Sabden Village up to the moors of Nick O Pendle. (#72 on 100 hill climbs). The climb averages approx 10%, but at the start there are a few sections of 16%. It has been used several times for the National Hill Climb Championship, including 1988 when a young Chris Boardman won his first hill climb championship, setting a course record of 3.29 (he used a 60 inch fixed). A 19 year old Malcolm Elliot was also national champion on this hill in 1980. Start at the lamp-post outside the apartment block on the site of the old garage in Sabden Village. Proceed up the hill to FINISH at the large stone at the start of parking area and approximately 50 yards before the crest of the hill.The course is approximately 1350 yards long and has a maximum gradient of 1 in 6. A youthful Chris Boardman takes his first National hill climb championship in 1988. Chris Boardman had finished second by less than one second to Paul Curran in 1987. But, after winning in 1988, he told Cycling Weekly: “I’m quite satisfied with the ride. It’s nerve racking to get it all out in three minutes. Some start too fast. 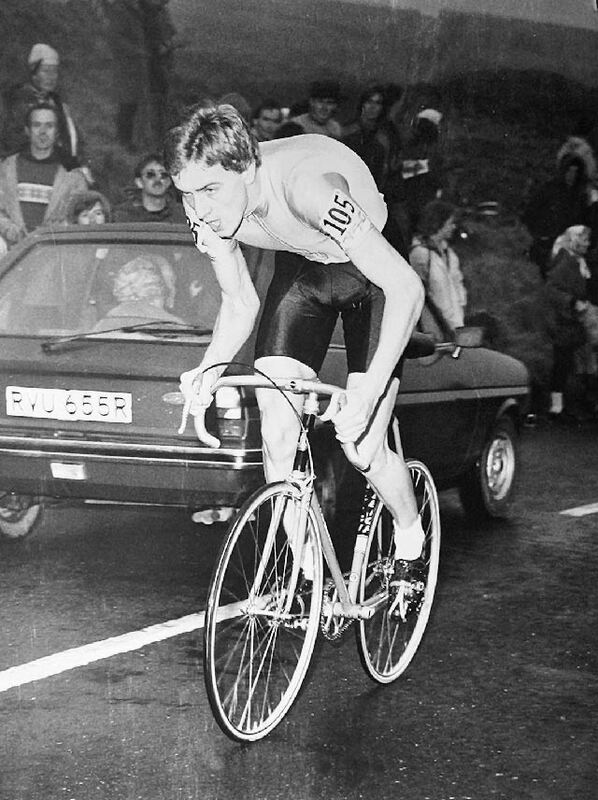 19 year old Malcolm Elliot (Rutland CC) on his way to the 1980 championship. 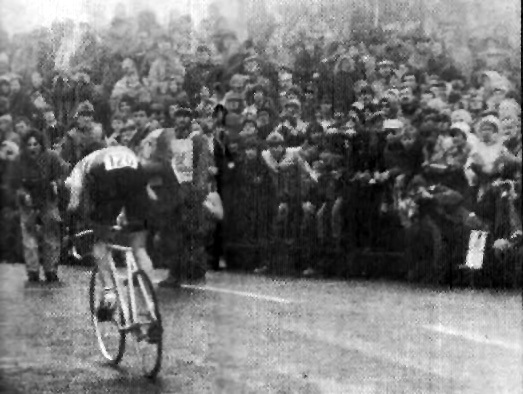 Last man Jeff Williams (and 1979 Champion) in the 1980 hill climb championships. He broke his nose before the race and did the race with blood coming down his nose. At half way he was four seconds up on Elliot, but by the finish had lost out by just 0.2 seconds. A very close championship. Cycling Weekly estimated a crowd of 5,000. I’m currently reading M.Hutchinson’s ‘Faster: The Obsession, Science and Luck behind the World’s fastest cyclists‘ (at Amazon on 27th March), I got mine from Waterstones) – I’m half way through already – it’s a good entertaining read, I’ll do a full review soon. But, at times I think aloud. ‘Very good, but can’t you just give me a list of things to buy which will make me go faster.‘ I’m not one of those who needs to understand the science behind going faster. I just want to know what I have to buy and do – preferably with a minimum of work and cost. One of the ways to go faster is buying food supplements. 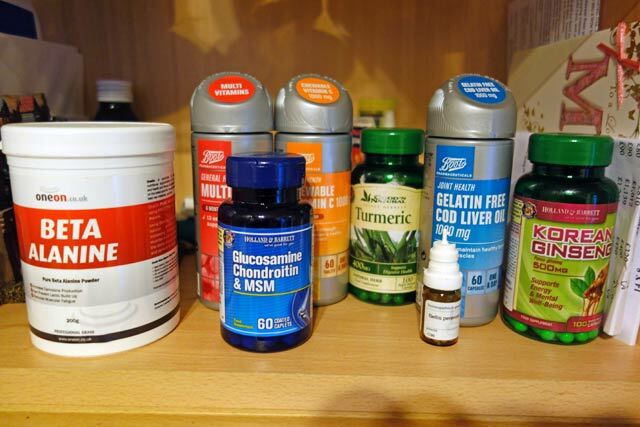 (the legal supplements of course) Over the years, I’ve bought all kinds of recommended supplements, which very confident sounding people have claimed will make ‘all the difference’. Beetroot juice, Beta Alanine, Cod liver oil, Creatine, tumeric powder e.t.c. The problem is that although I’m very good at buying supplements, I’m very bad at actually taking them. I have a cupboard full of 3/4 full tablet jars. I buy supplements with good intentions, but somehow I always forget to take them after the first few weeks of enthusiasm dies off. Every five years I go through the cupboard and throw away everything which has gone well past its Best Before date. A few seasons ago, I was convinced that drinking a litre of beetroot juice before a race was worth at least 30 seconds in a 10 mile time trial. I clung to this rather unscientific theory because one day, after gorging on the purple stuff, I’d managed to take 3 seconds off my 10 mile pb on the F20/10. The only problem with this wonder product, was that it rather reliably gave an unpleasant case of diarrhea. It’s one thing to lose a bit of weight before a race, it’s another to lose all your minerals and salts. Although I liked the idea of Beetroot juice and was pretty attached to the concept Beetroot juice made you go faster, even I had to admit it was interupting my pre-race routine. Alas, I had to give up this wonder supplement, but fortunately, it didn’t seem to make any difference to my 10 mile time trials. A few weeks later, I went up north to ride the V718 and took nearly a minute off my 10 pb from 20.00 to 19.07. So much for beetroot juice, when you can ride on a motorway. Anyway back to reading Hutchinson’s book ‘Faster’, I was nervously getting half way through the book when those insistent voices were getting louder. ‘But, what can I do to actually make ME go faster?‘ Jokes are fine, but I want something to make me faster, preferably with not too much work. Thank-fully, Hutchinson came to the rescue saying that some supplements are generally agreed to really make you go faster. He mentioned three, Beetroot juice, Beta Alanine and Fish oil. Do you ever wear lycra on a bike? b) I cycle to work in lycra shorts and then change into my work clothes. d) I have spent £250 on a semi- see-through – figure hugging skinsuit. 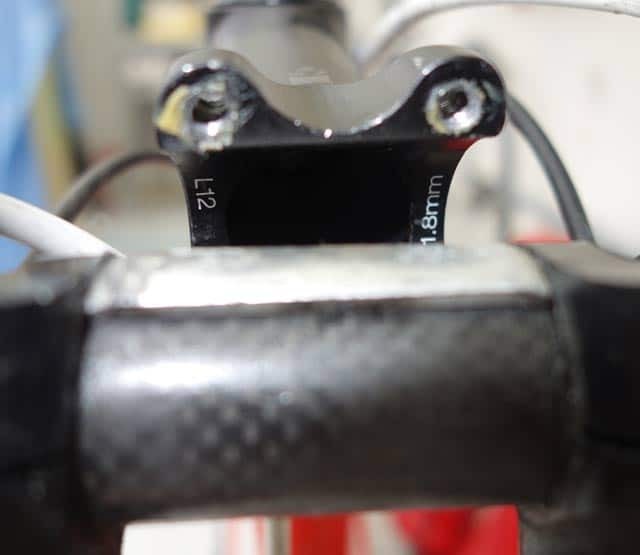 How do you respond to a question about which is better – Shimano Di2 or SRAM Red mechanical? a) Is Shimano the thing which moves the chain? b) It is only for those who have more money than sense. c) Although SRAM red is 150grams lighter than Di2, on balance the easy of shifting will save me 1 or 2 watts in a race. What is your favourite speed for cycling? b) I cycle at a steady 15-17mph. c) I once did 50 mph down a steep hill in Yorkshire. d) The fastest speed I can go at without passing out. Do You Wait at Traffic Lights When They are Red? b) Yes, Unless no one is looking. c) I thought red lights didn’t apply to cyclists? d) You don’t get red lights if you do a proper race (or on a dual carriageway). How Much Did you Spend on Your Latest Bike? a) £25 6 shillings and 3 pence. d) Free bike from team. How do You Feel When Another Cyclist Goes Past You? a) I feel sorry for those cyclists who arrive at work all sweaty. c) I’ll just draft behind them for a few minutes before leaving them for dead on the long hill past the traffic lights. d) A recovery ride is a recovery ride. How long do you spend watching the Tour de France? a) Well, I quite like the mountain scenery in the Alps. But, why I don’t understand why only one rider is wearing a yellow jersey. c) I can recite the most memorable lines of David Duffield and Phil Ligget by heart. d) Only the highlights to see how I did in the stage. So What Type of Cyclist are You? Mostly B’s – You’re a good old fashioned cyclist who just rides the bike because you like doing it. You probably remember the days, when people used to cycle to youth hostels, with little more than a few pence in the pocket and a spare pair of socks. Mostly C’s – If fate had been different, you could easily have been a Tour de France rider, but you’ve made up for a lack of pro wins by sprinting for village road signs on Winter Training runs. At least you look the part and have better bike handling skills than triathletes. Mostly D’s – The real deal. Congratulations on your new contract with Team Rupert Murdoch professional cycling team! I don’t know why but apparently, there are some people who hate cyclists . I can’t understand. As a motorist I find many excellent reasons to love cyclists. Here are a few, I’m sure you can add a few more. 1. 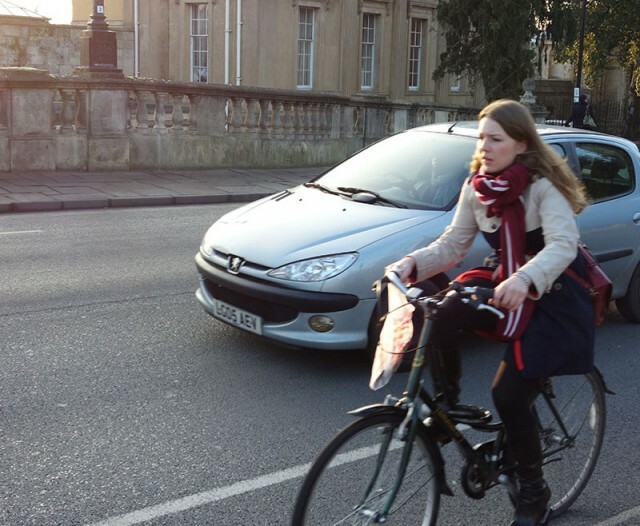 Target Practise – A cyclist helps develops our advanced motoring skills. For example, how close can you get to a cyclist without knocking them off? This is quite an art – best practised in a white van whilst travelling 15mph above the speed limit and with mobile phone in your right hand. You have to be careful though because occasionally, cyclists may make ‘dangerous manoeuvres’ like move 10 cm to the right to avoid a pothole in the road. If they have the audacity to move more than 1 foot from the edge of the road see no.2. 2. Practise Your Musical Rhythms. If you see a cyclist in the road, this is an excellent reason to practise sounding your horn. You can practise the art of playing your horn very loudly or you could just practise a simple rhythm like repeatedly holding the horn down. Unfortunately, this can often lead to disappointment as for some reason, beeping a horn is insufficient to make a cyclist disappear from OUR roads. 3. Feeling of Superiority. Now, some cyclists can having that annoying air of self-righteous superiority. They think they are saving the planet by eating home grown leeks and cycling to work. But, whilst we can tolerate their imaginary fantasies, we actually know it is us motorists who are saving the environment because of our decision to use unleaded petrol and occasionally buying 40% recycled plastic in our car air fresheners. 4. Funny To Splash People. This is related to no.1 but actually more fun. With driving over a puddle we get to see more physical evidence of our driving skills. When the road is waterlogged if you drive really fast over a puddle, a big stream of water gets sprayed over other road users and pedestrians. Just watch the face of a cyclist after he gets soaked with your puddle – priceless! 5. Odds Are in Our Favour. Crashes are inevitable on our roads, well at least they are inevitable if we don’t pay attention whilst driving and try to send a text or fall asleep at the wheel. In fact vehicles on British roads kill over 3,000 people a year, but, when you do crash into a cyclist, the odds are heavily in your favour. Their lycra shorts may make a dint in our paintwork, but, this can usually be fixed. Just image if cyclists drove Sherman tanks – when we knocked them down we would have more than a bit of dinted paintwork to deal with! 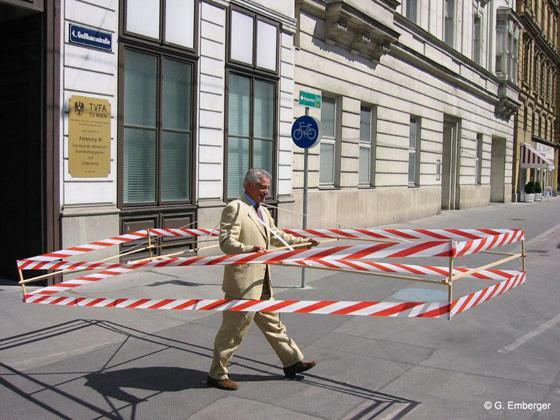 Now that wouldn’t at all be fair – so we should be grateful to cyclists for not threatening our reinforced steel SUVs with nothing more than a thin layer of slightly ridiculous lycra. 6. Humour. Driving is a pretty boring affair. I mean we get stuck in endless traffic jams and it can take one hour to travel just a few miles in Central London. Now it’s pretty annoying that cyclists don’t get so caught up in the traffic congestion – often sneaking up on the inside in these ridiculous cycle lanes. But, next time your stuck in a traffic jam feeling miserable that other people won’t leave their car at home, why not pass the time laughing at other road users. Cyclists are bound to be wearing some ridiculous clothing, or maybe they’re just getting wet. Look on the funny side of these absurd cyclists and suddenly those interminable traffic jams will fly by! 7. Cyclists don’t Wear Down the Road. 8. Cyclists don’t Pollute the Environment. No one likes the exhaust fumes created by cars. It is unpleasant and can cause health problems like asthma, not to mention the problems of global warming. But cyclists don’t create any pollution, at least if you don’t count the by product of all those organic baked beans, these hippie, sandal-wearing cyclists often eat. Try parking in Central London, – a nightmare. You can spend hours driving around looking for a spot. Just imagine if every bike took the space of a car. We would never be able to park! 10. Cyclists don’t Cause Congestion. 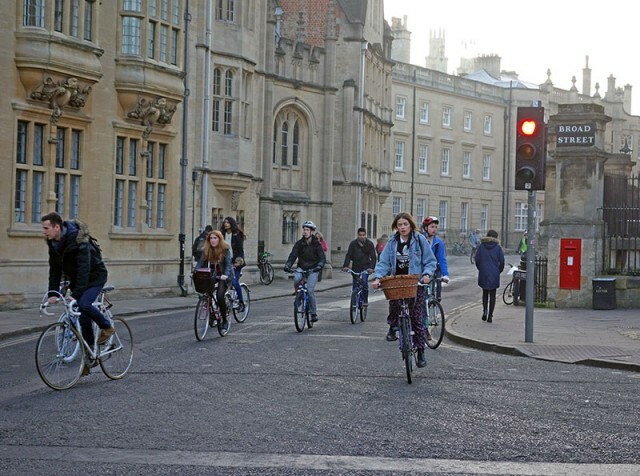 Congestion would be even worse if cyclists started driving. 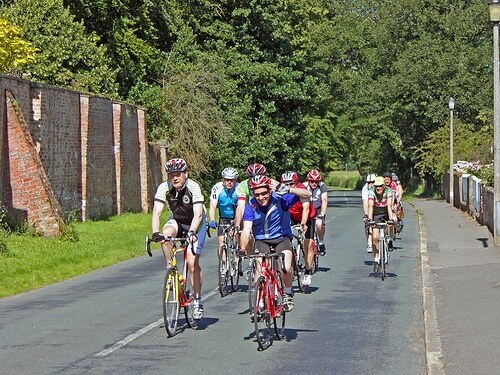 Every cyclist means quicker journey times for us. 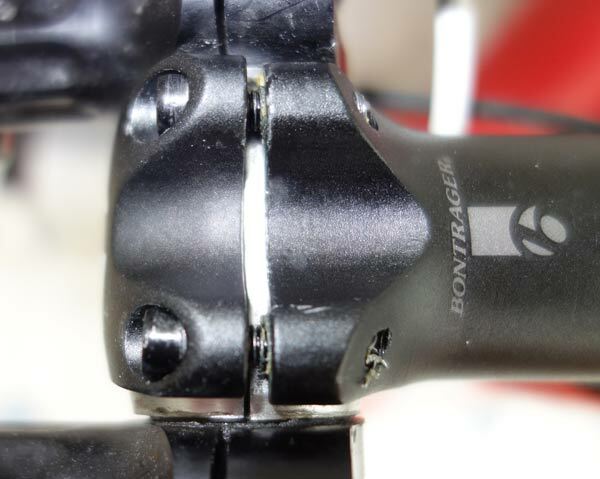 Last week I broke a stem due to tightening up the four bolts at different angles. Not wanting to miss a day’s training, I bought a new stem on Monday for £14.99. However, I didn’t make a good job of fitting it. Firstly, the tribars are the old standard diameter of 26.0mm. But, most stems these days are the ‘oversize’ 31.8mm. Therefore, I’ve been using some spacers to make the standard size of the tribars / handlebars fit the bigger stem.